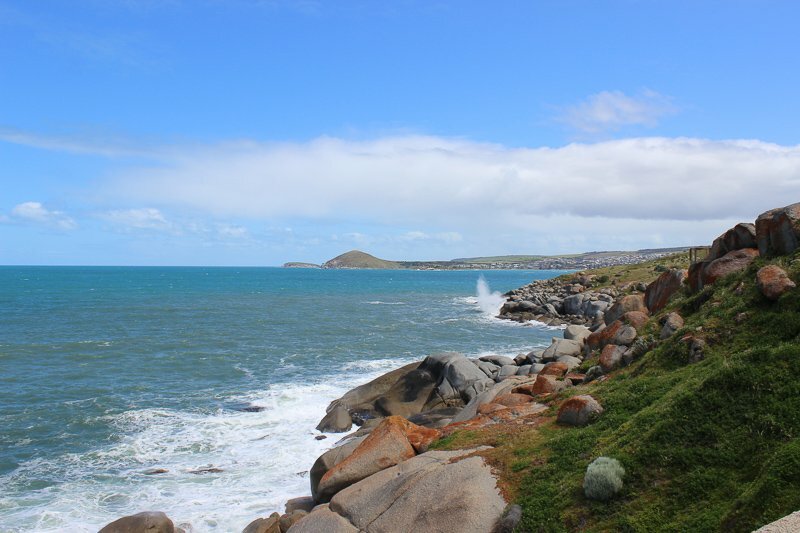 Victor Harbor is a popular coastal town about one hour south of Adelaide on the Fleurieu Peninsula. 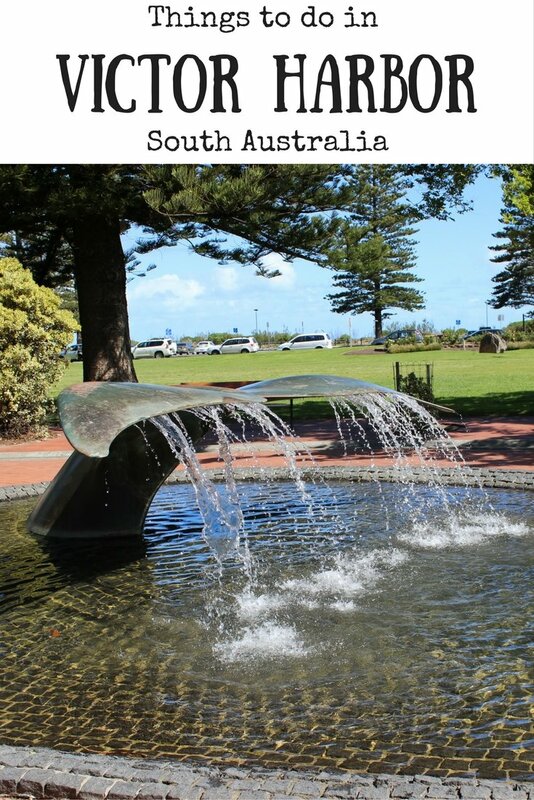 It has a population of around 12,000 people, but this swells considerably during the summer as many people from Adelaide flock here to enjoy the seaside and attractions. 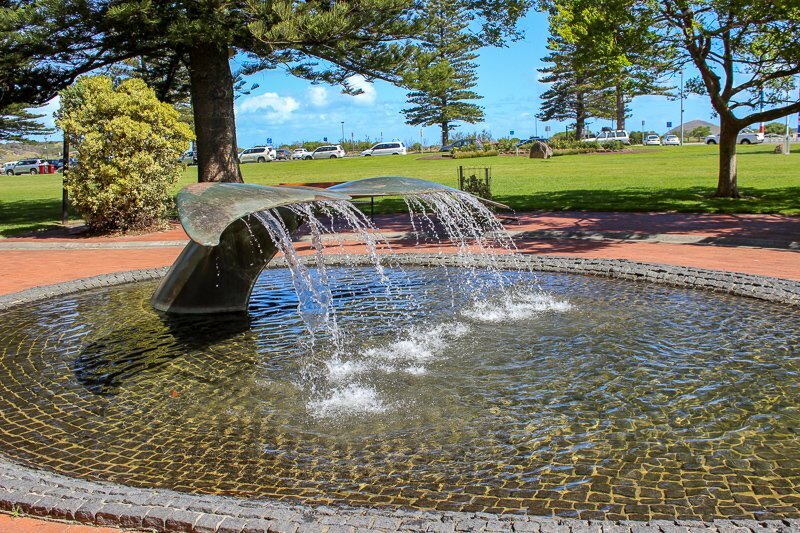 Here are a few of the things to do in Victor Harbor. 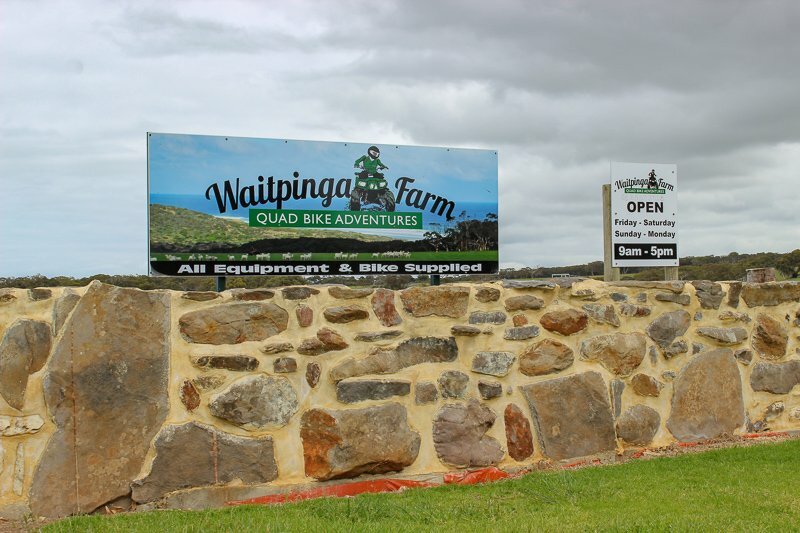 We have been lucky to win a gift voucher at a quiz night a few months ago for a quad biking tour at Waitpinga Farm, about 15 minutes from Victor Harbor. We decided to turn this into a weekend, and revisit a town we hadn’t been to in around 15 years. On previous trips we were here for an event, or with other people, so this time we tested out some of the biggest tourist attractions for the first time. 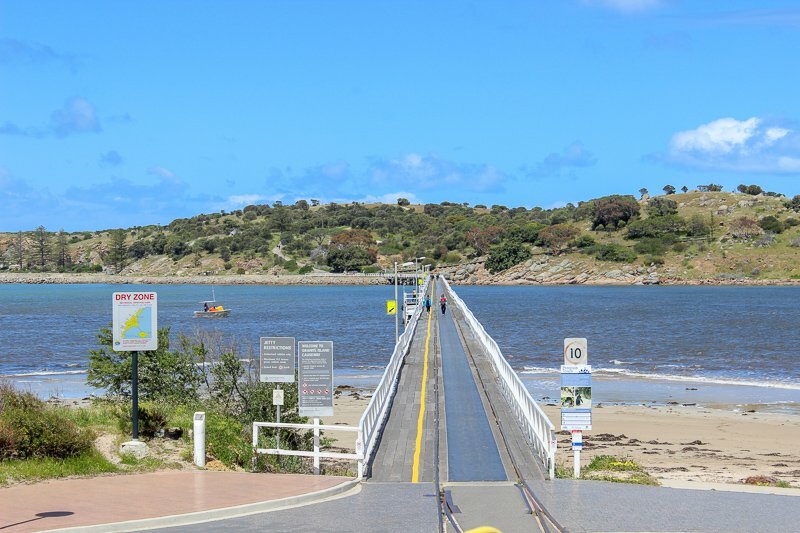 The tramway from Victor Harbor across to Granite Island was originally opened in 1864, with the first passenger trams making their way across the 630m Causeway in 1894. 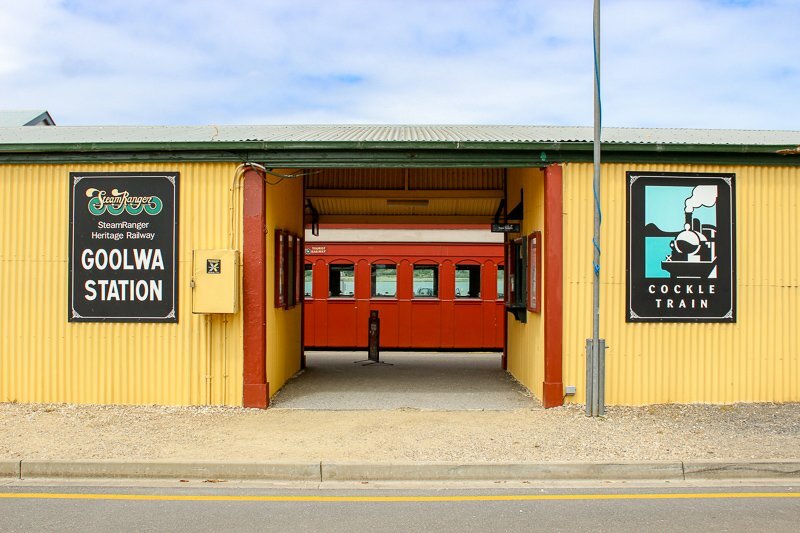 The original trams were replaced in 1931 with six window double-decker trams that were no longer required at Moonta. In 1955 the tramline was removed from the Causeway, and it wasn’t until 1985 that it was relaid for the tram to run as a tourist attraction. 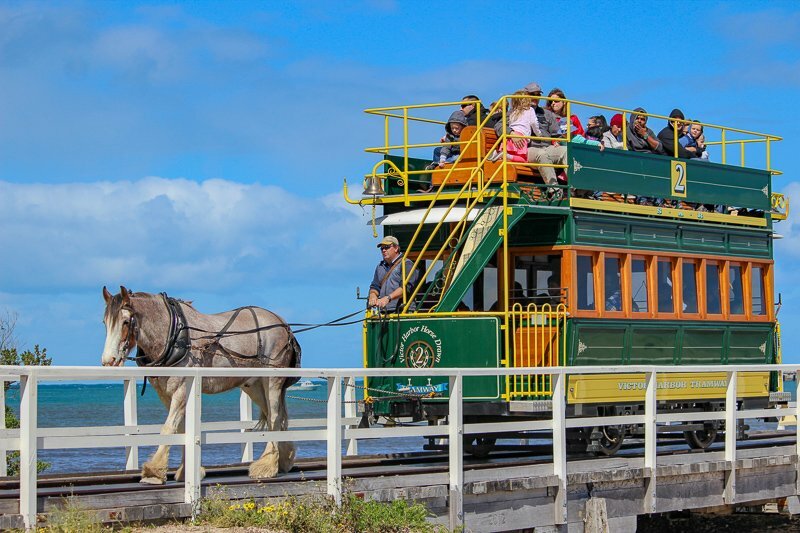 Replica trams were built, and today the four trams are pulled by a team of eight Clydesdale horses on rotation. I was a little concerned about the horses pulling all that weight of the tram and the passengers, but felt a little better on reading that the tram uses roller bearings to give it a rolling weight of only 80kg. There were two Clydsdales in Victor Harbor when we visited. One taking the tram over, the other resting for his turn next. The horses are ridden from their property through the streets of Victor Harbor each morning on their way to work. They looked healthy and relaxed. We sat on the top deck of the tram to get some great views as we ambled along. This was risky, because the day we visited rain was threatening. It also meant once we were out over the water, it was quite windy with a chilly breeze that felt like it had come straight from Antarctica. The ride is quite slow – a brisk walk would get you across the Causeway quicker. The tram ride costs $7AUD for a one way trip, and $9AUD for a return. For most of the year the trams are an hour apart, but in the summer they can be half an hour apart if busy. We chose the one way trip because we were quite happy to walk back, and we weren’t sure we wanted to spend the whole hour on the island. For more information go to the Victor Harbor Tramway website. 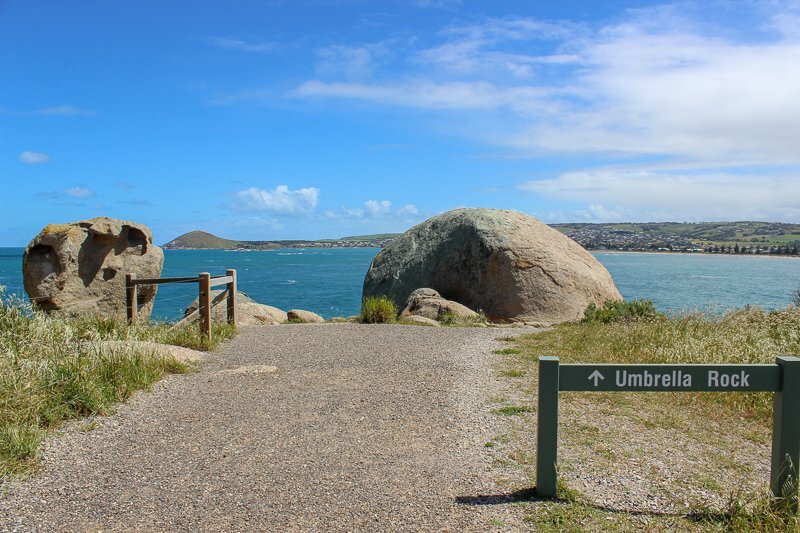 Granite Island sits just off the coast of Victor Harbor and is most well known for it’s colony of little penguins. Up until earlier this year there was a Penguin Centre for seeing the penguins, but now the only way is to do a penguin tour at dusk. We did not do the tour, since it was bitterly cold during the day and I hadn’t brought my thermals to brave those winds once the sun went down. 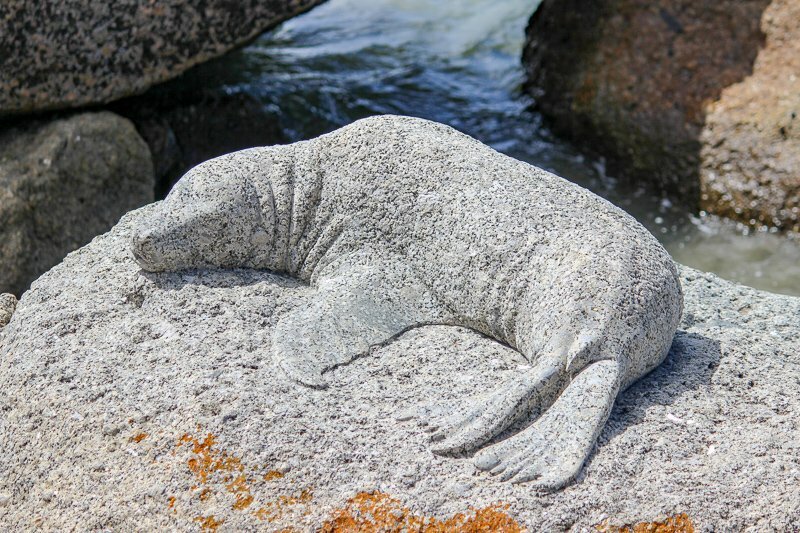 The island is scattered with granite boulders which are often covered by an orange lichen. It is great for walking, with some spectacular views out to sea and along the coastlines. We took about half an hour to stroll from where the tram dropped us off around the southern edge of the island and back to the causeway. The island has very few facilities, but there is a picnic area with toilets for public use. Calm seas on one side, rough on the other. 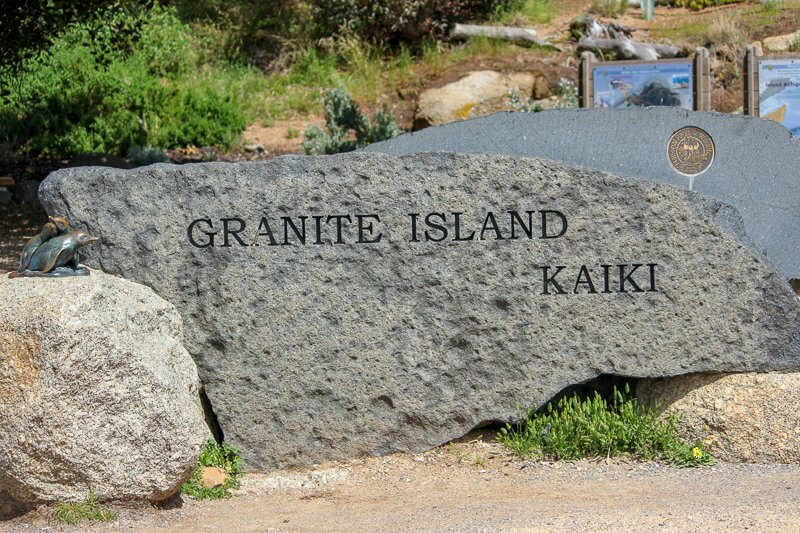 Some of the granite rocks the island is known for. Looking back over the Causeway to Victor Harbor. On our return to the mainland we made a quick visit to the South Australian Whale Centre. During the winter months, Victor Harbor is a good place to spot Southern Right Whales playing in the waters just off the coast. 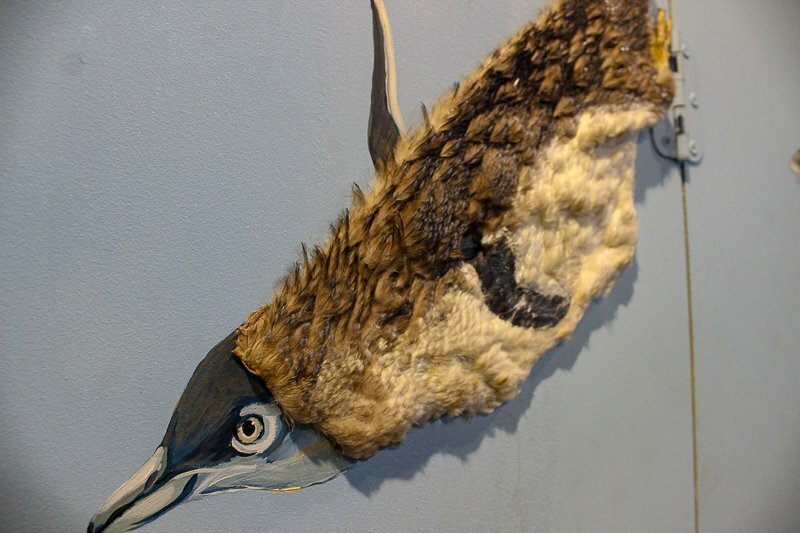 In years past this area was instead known for whaling, and the South Australian Whale Centre shares a little of that history as well as information related to preservation of the whales today. The centre is over three levels, but don’t let that fool you into thinking it is large – it isn’t. 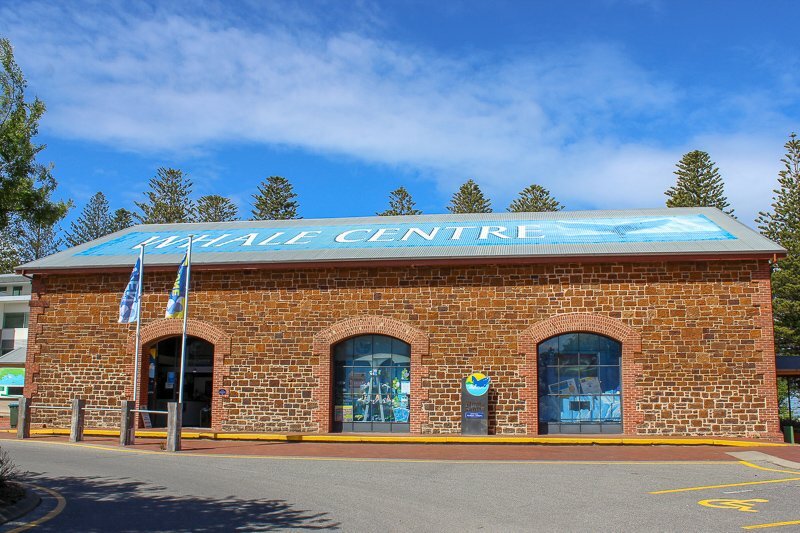 It is currently housed in the old tram barn, not far from where the Causeway meets the mainland again. 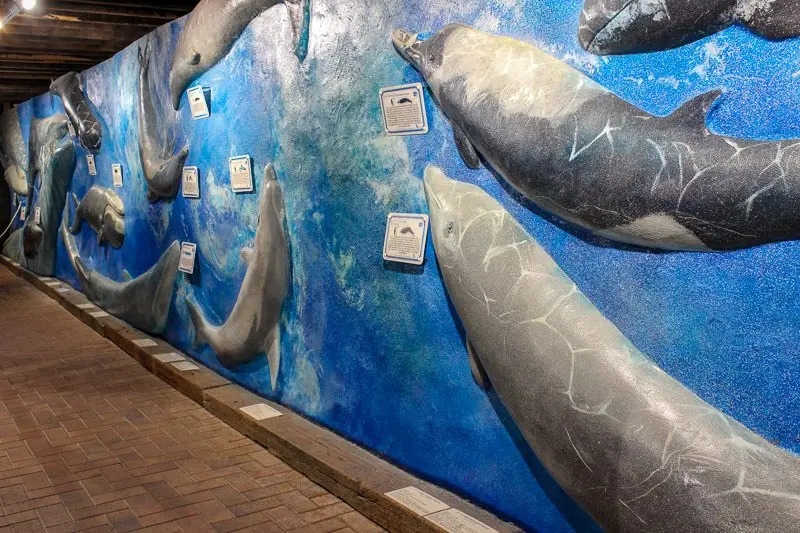 It was good to have a look through, but the South Australian Whale Centre is mostly geared towards education, and therefore a lot of the information was targeted to children. If you are coming here as a family, this will keep the children interested. There are many things they can touch and look at in detail. 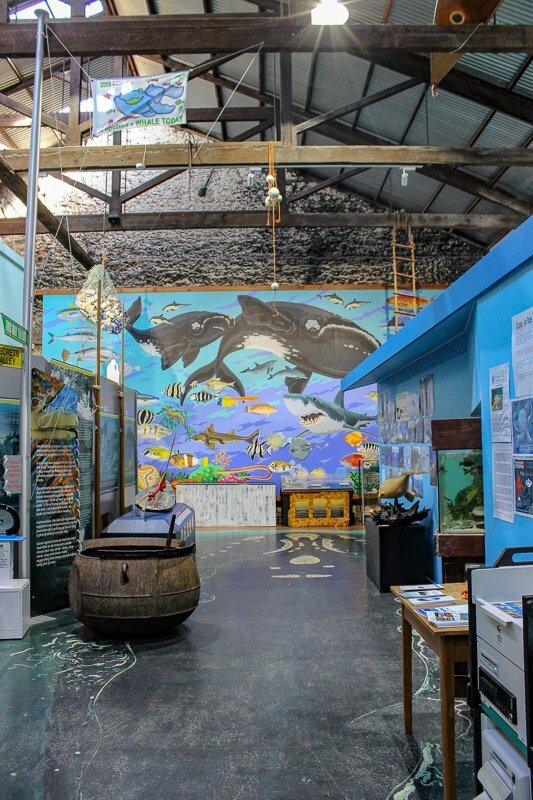 There are special programs throughout the school holidays especially for kids and an area upstairs that is used for school programs and group visits. 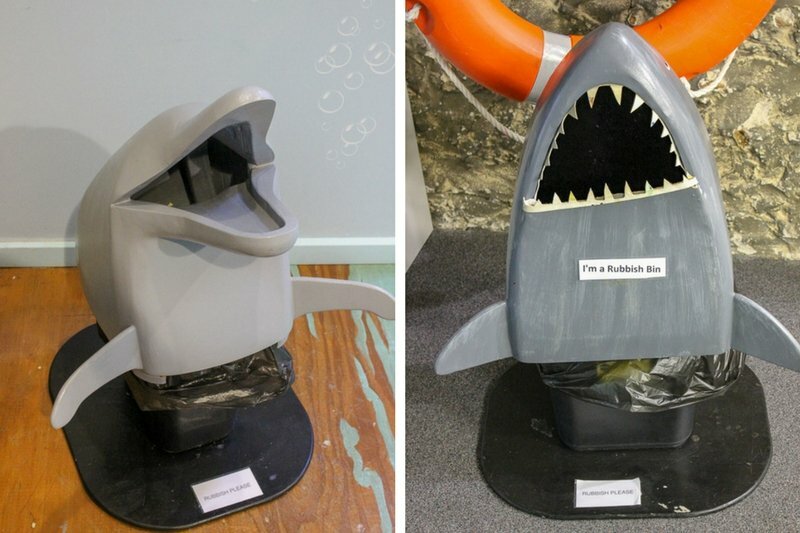 Admission prices were $9AUD per adult, with a family ticket for $24AUD. 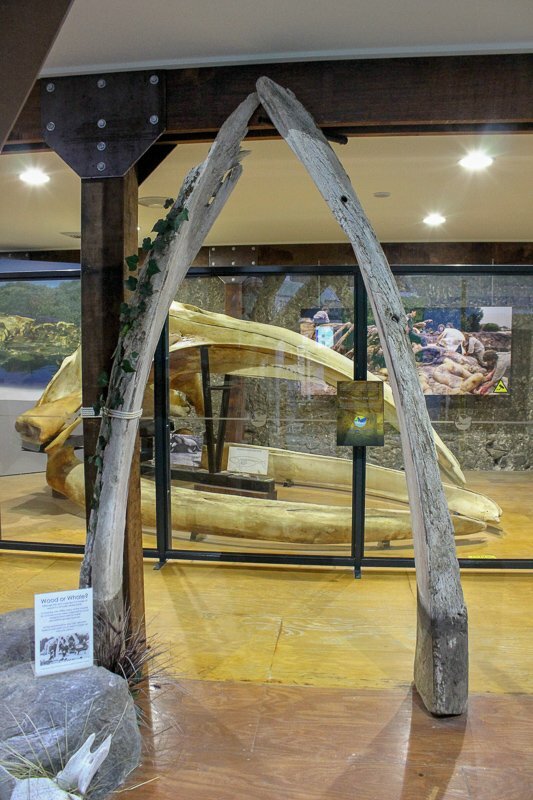 More information about the South Australian Whale Centre can be found on their website. Penguin fur? Or is it feathers? 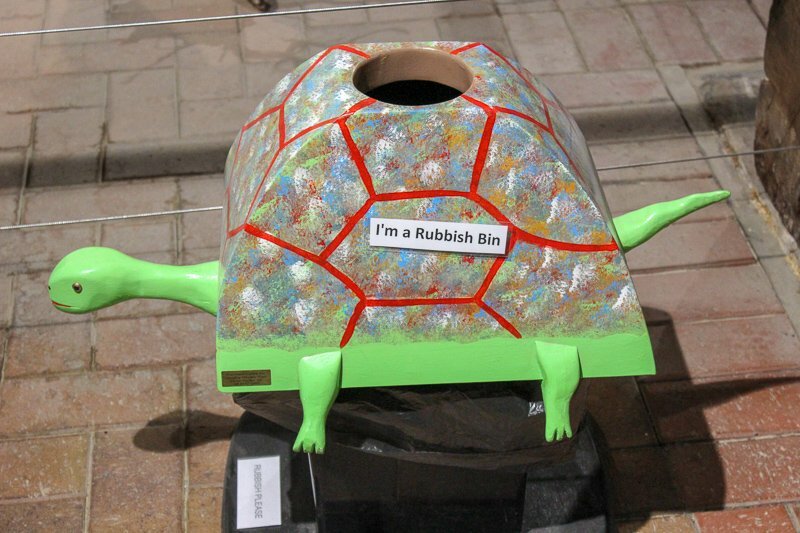 There were really cute rubbish bins throughout. This is what we came for. We head out of Victor Harbor to Waitpinga Farm under more grey skies. We were doing the Adventure Tour, which lasts for 90 minutes, so we were just hoping there would be no rain until after that. On arrival we were kitted out in safety gear, and then were taken through how the quad bikes worked. To ensure we got the hang of the bikes and to assess our levels of competence, we had two or three laps around a small track before heading off around the farm. We then had about an hour of riding around enjoying the views. We had the chance to go quite fast on some sections, make our way through some sandy twists and turns, and negotiate mud and small creeks. There were some stops along the way. 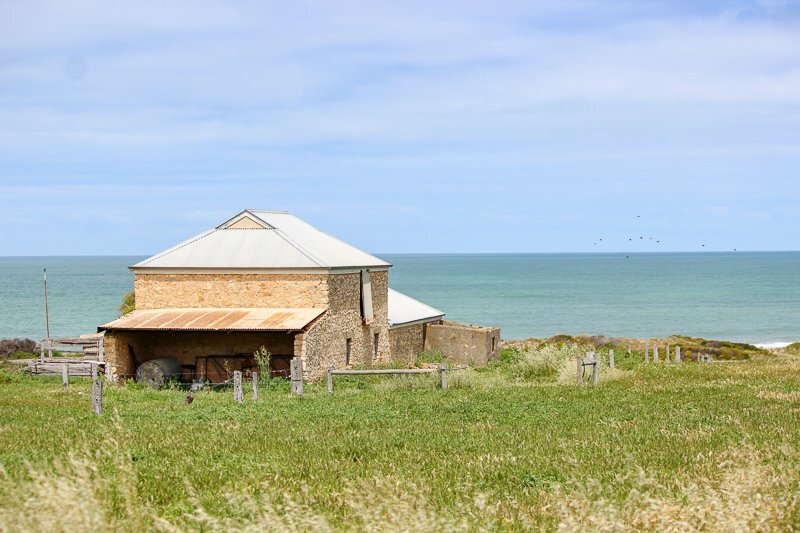 The first was overlooking the stunning coastal views, and our guide told us a little about the history of the farm as well as the native animals that can be found there. Back on the bikes we headed to an old cottage built on a picturesque little creek. The cottage was an original miners cottage. It’s now a retreat for visitors to enjoy some solitude with nature. Now it is a stop for billy tea and roasted marshmallows, and to allow the quad bike riders to take a moment to appreciate the surroundings. While we were here, two wedge tail eagles flew overhead, as our guide had been mentioning. Our final stop was at the old gold mine on the property. Some parts are over a hundred years old, and digging in the area of unearths treasures from times past. Overall this was a fantastic way to get out and see some of the area, and to learn a little along the way. Quad bikes are of course fun, so there was the simple thrill of riding too. 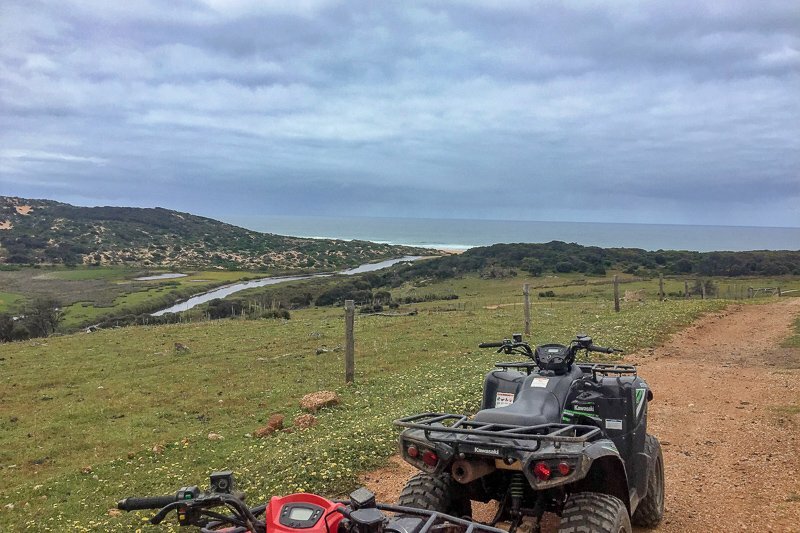 A full review of our quad bike adventure is at OurWorldinReview. 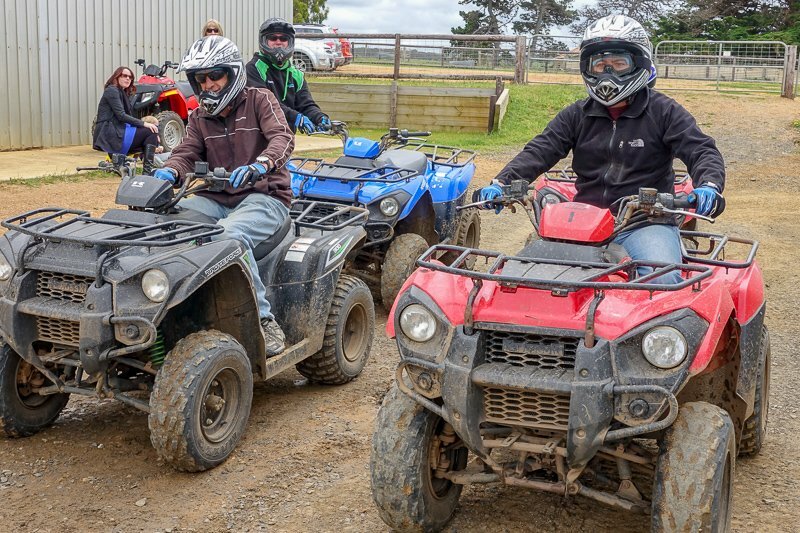 For further information, go to Waitpinga Farm Quad Bike Adventures. 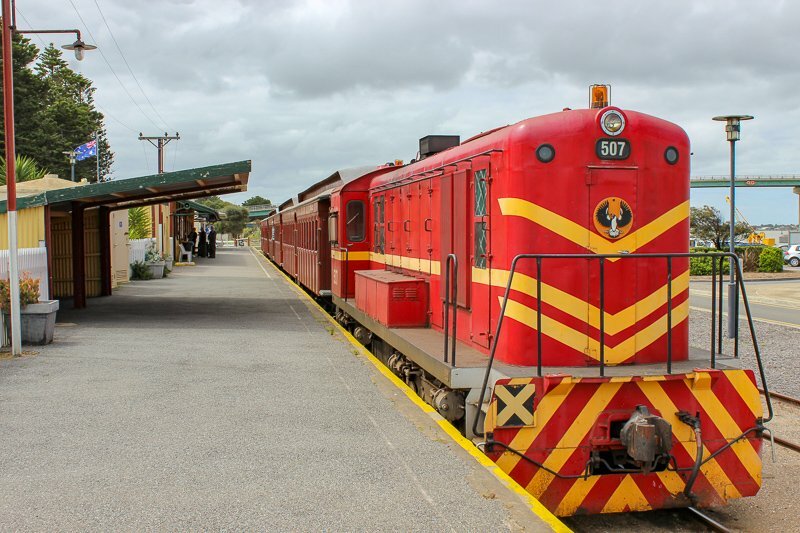 The Cockle Train runs from Goolwa to Victor Harbor and back three times on Wednesdays and Sundays with additional days during the holidays. 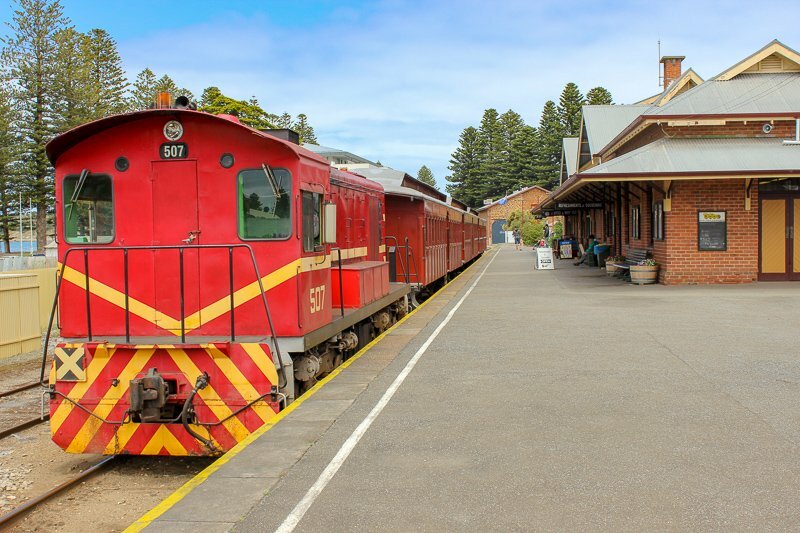 It runs along the oldest steel railway in Australia and got it’s name when Victor Harbor locals started travelling on it to Goolwa to collect cockles from the sand banks when the tide was out. We arrived back in Victor Harbor in time to catch the 1;30pm train to Goolwa. We purchased our tickets ($29AUD for the return trip) and wandered out on to the platform. I was a slight disappointment to see that our engine for the day was not the steam engine feature in all the advertising, but rather a diesel engine. We were later to learn the Steamranger was being serviced after a charter the day before. 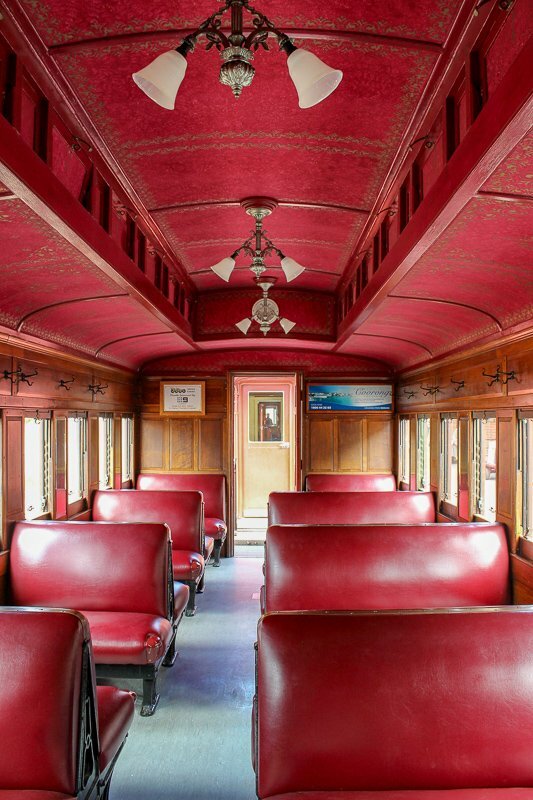 The old carriages are nicely maintained and comfortable. They have leather seats and still have windows that can be opened. The trip to Goowla takes around half an hour. It was really relaxing sitting back watching the landscape slide past with the wind in our faces and the clickety-clack of the carriage wheels on the train tracks. 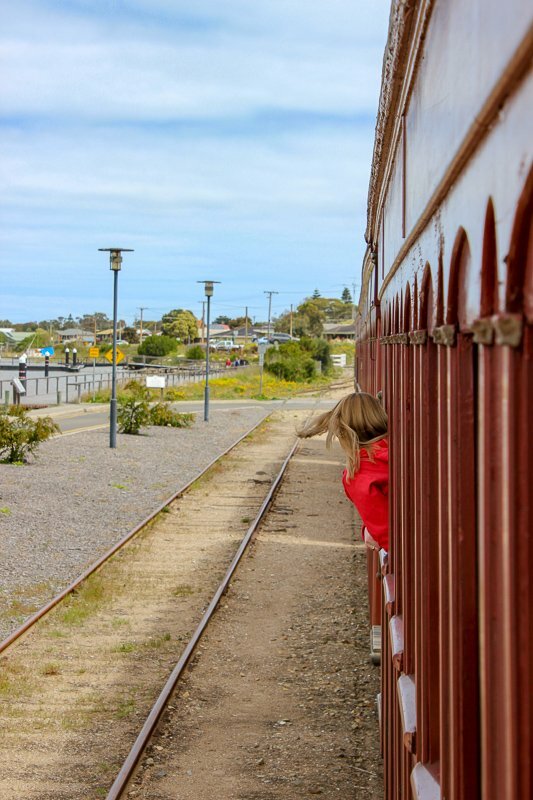 The train stops at both Port Elliott and Middleton along the way, until finally pulling into the Goolwa station. We had around 45 minutes until the train returned to Victor Harbor, so took a stroll around the area. The train station is right beside the water, and there are a few places nearby to get food and drinks. There is a cellar door nearby if wine tasting appeals to you (it does to us!). As we wandered around, we decided that this would be better if we have caught the first train in the morning, spent a few hours in Goowla, then caught the last train back. 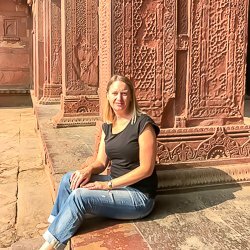 The only choice was to get on the next train – unless we wanted to walk! Ready to return to Victor Harbor, this time with the piping shrike of South Australia on the front. 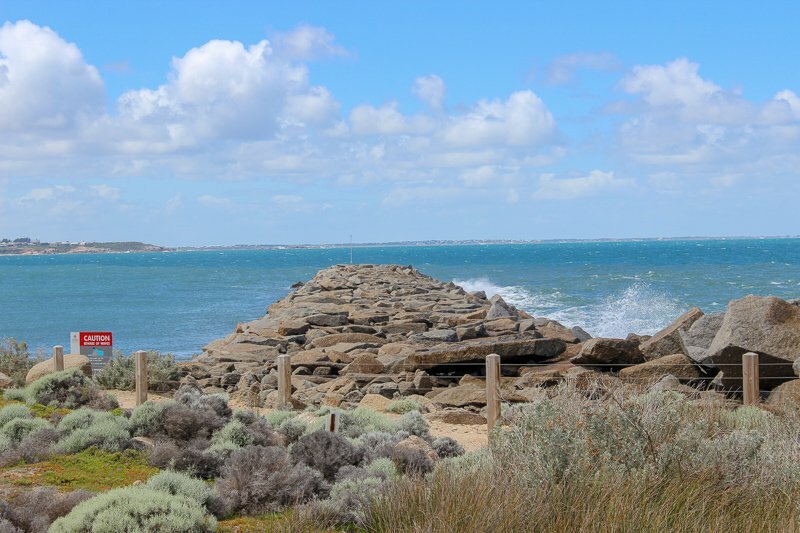 Our weekend in Victor Harbor was really enjoyable and went quickly. There is so much to do, even on a cold, almost rainy, weekend. We didn’t get to Urrimbirra Wildlife Park where you can get up close with koalas and many other native Australian animals. We would also have liked to walk up to the top of The Bluff to see the awesome views. 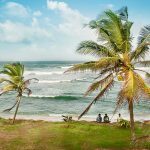 The options become endless if the weather is warm, with the surf beaches and other water activities. 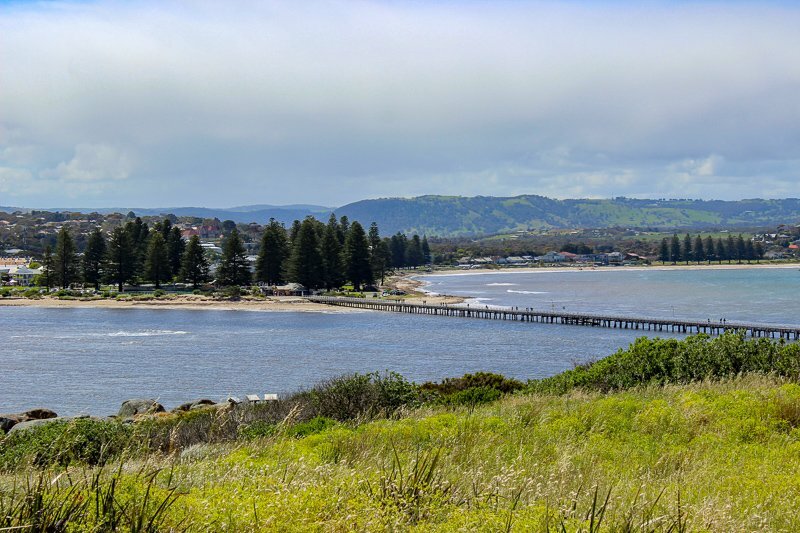 There are plenty of options for Victor Harbor accommodation, ranging from backpacker hostels or the Victor Harbor Caravan Park to four star at the McCracken Country Club. We stayed at The Bluff Apartments. Please click here for full review. Food options are also numerous, ranging again from fast food outlets to fine dining restaurants. Reviews for all our meals are at OurWorldinReview. We had a great weekend and plan to head back down to Victor Harbor soon. 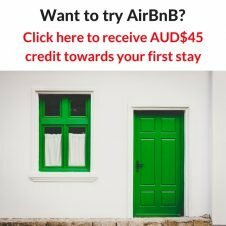 Looking for somewhere else to visit in South Australia? 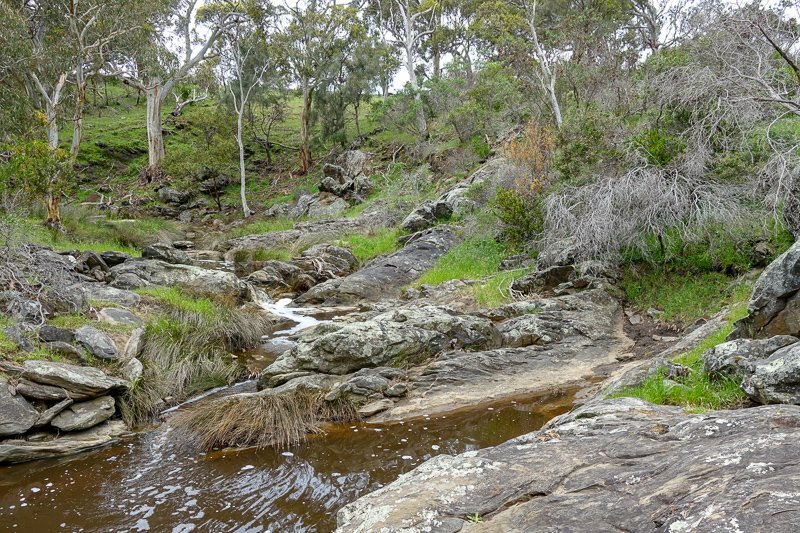 How about Hahndorf or the Flinders Ranges? 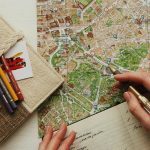 Or click through the below for more ideas. 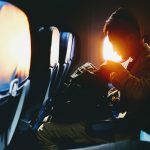 *Note – this post contains affiliate links. 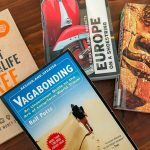 If you book using these links, then I receive a small percentage to help me fund this page. Thank you for your help.